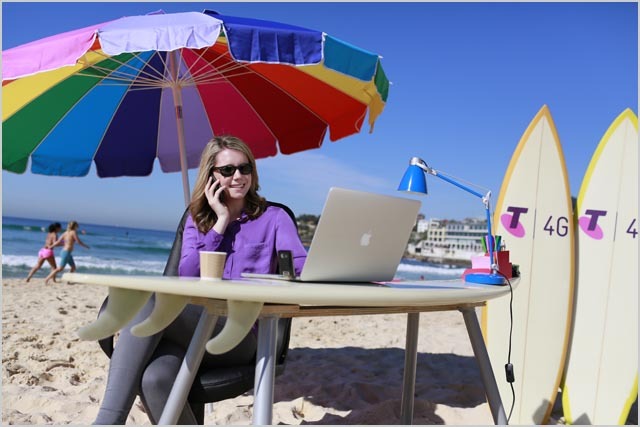 blog Right now the nation’s biggest telco Telstra is on top of the world when it comes to its mobile network. It’s got more than 1.5 million customers, at a time when Optus won’t say how many it has and Vodafone has precisely zero. And it looks to have snared the lion’s share of iPhone 5 buyers as well, selling more than 500,000 of the Apple units in the second half of 2012. Telstra Chief Operations Officer Brendon Riley said Telstra was looking at new ways to plan for the ongoing surge in mobile data traffic on its networks, with Telstra customers expected to use as much mobile data in 2013 as they did in the past two years combined. The strategy is part of Telstra’s $1.2 billion wireless network investment for 2012-13 that will include trialling and introducing advanced technology across the country. Mr Riley said Telstra was broadening the scope of its 4G network, adding a second wireless frequency (900MHz spectrum) to better cater for increasing mobile use in regional areas. The lower frequency of the 900MHz spectrum band improves signal range and depth making it ideal for use in areas where improved range or signal reliability is required. Telstra is also trialling the next generation of wireless 4G technology, known as LTE-Advanced with plans to introduce it later this year in areas with heavy traffic demand over a greater distance. LTE-Advanced uses the 900MHz and 1800MHz spectrum bands together, allowing more data to be carried faster, unlocking more capacity for mobile use. In addition to these measures, Telstra is trialling small cell networks – known as heterogeneous networks (HetNets) – to expand network capacity in busy locations with a dense population such as city centres and sporting stadiums. This can complement our existing network by targeting high traffic areas where it would be difficult to build additional large scale base stations. The works are being undertaken with Telstra’s long-term partner, Ericsson, which is the sole supplier for the rollout of Telstra’s LTE network. Here comes the atomic banana! So Telstra’s going to have 2 4G networks before Vodafone has any… It’s good to see that they are being proactive in developing and expanding their network. it seems they’ve certainly learnt from Vodafail and Optus’s issues with network capcity in the past. I think you’ll find whodathunkit is 1 word! Where did this spectrum come from? Did they already have it unused? No, they are recycling their 2G spectrum. Are the phones currently on offer from Telstra capable of LTE at 900MHz? Is the iPhone? The only phone on sale now is the Lumia 920. The iPhone 5 doesn’t and neither do any of the other phones. The new Blackberry Z10 and Xperia Z supports it when they are released. They have a few lte2100mhz sites up as well, which the iphone does support. Telstra’s LTE network is fast with great coverage, and its great to see continual expansion and better coverage, but I’m longing for the prices to ease just a little, and/or the available data caps to increase so I can actually use it more. Rather than raise data caps to more appropriate tiers when Telstra moved from 3G to 4G, they seem to have just raised the prices slightly, and left the available data plans the same (I think the max plan has gone from 12GB to 15GB a month for home users?). I’d rather half the speed with twice the data. Pity Telstra are the only carrier in Hobart with LTE. HTC: None (shame on you HTC)!